This is going to be the final word on dates for the time being. I invited two couples, Doug and Bee and Ken and Chai, over for Sunday brunch. Since I had been on such a roll this week with date-themed recipes, it became something like an Iron Chef challenge. This meal’s challenge ingredient: dates. In all humility, it turned out pretty darn good. Let me share the menu with you. An amuse bouche of sedai dates stuffed with a little French chèvre (soft goat cheese) and a sliver of almond. What a tasty combination! The orange rind, which I should have salted, was more for presentation than flavor. Had it been salted, I think it would have been a nice contrast and would have really stimulated the appetite. Two of our four guests – Doug and Bee. Doug is a fellow American who lives in our neighborhood. Credit goes to Tawn for the elegantly understated table setting. 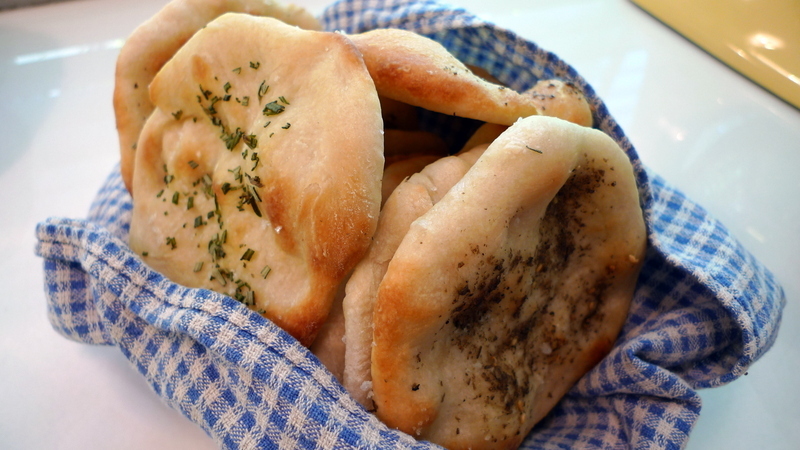 Two types of flatbreads. Both were brushed with melted butter and sprinkled with coarse sea salt. The one of the left has freshly chopped rosemary. The one of the right has za’atar, a Middle Easter spice mixture that contains oregano, thyme, basil, savory, and sesame seeds. The main course was the Moroccan style braised chicken. This picture doesn’t quite flatter the dish, which I thought was the standout of the meal. Wednesday’s Moroccan Pork Chop dinner (my blog entry about it and the original recipe I followed) was the starting point. Based on what I learned from that recipe, I repurposed it for chicken. 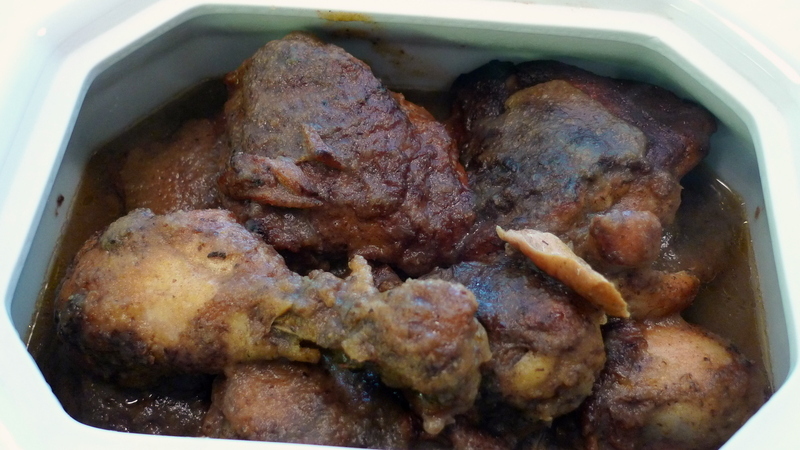 Zakiah suggested a recipe for tamarind-date sauce (thank you – what a great idea!) and I extrapolated from that and braised the chicken instead of just pan frying it. The chicken was brined for four hours in a mixture of buttermilk, salt, and cayenne pepper. While it was brining, I created a tamarind-date sauce. This was a learning experience as I haven’t worked with tamarind paste before. Tamarind paste comes from the flesh of the ripe fruit of the tropical Tamarind tree. The flesh is very sour with just a hint of sweetness. Mashing the paste in a little warm water, you can extract a thick liquid with which you cook. A little goes a long way! To make the sauce, I sauteed an onion with the same spices I used for the chicken. Once the onion was soft I blended it with chopped dates and the tamarind water. Then I thinned this mixture with broth and cooked it down for a few minutes. While the sauce reduced, I rinsed, patted dry, and dredged the chicken pieces with a spice mixture, then pan fried them a few pieces at a time. Once all the pieces had formed a nice crust, I returned them to the pot and added the tamarind-date sauce, covered the pot and cooked for an hour at low heat until the chicken was tender and cooked through. The nice thing about this recipe was that it could be prepared the day before then reheated. Tender, flavorful, and convenient. 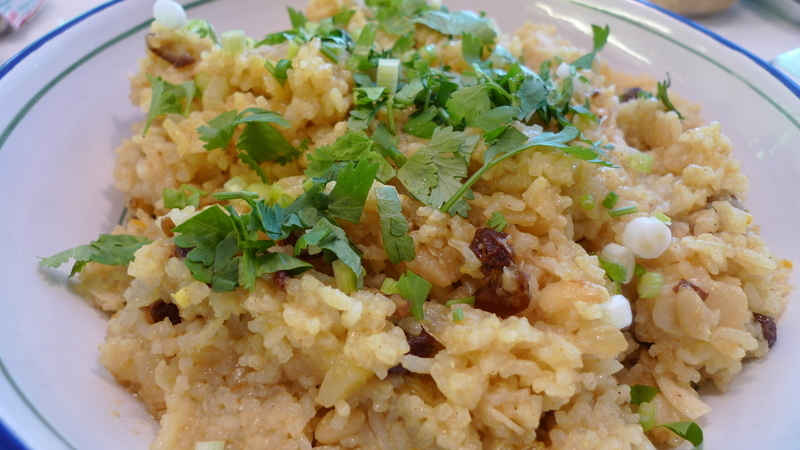 To accompany the chicken, I made another batch of the Moroccan style rice. (Recipe I started with but I modified it a lot as I don’t cook with a microwave.) I was out of apricots so used dates, raisins, and dried mango to accompany the rice. Interestingly, this batch turned out much softer and mushier than the one I made Wednesday. I used the same type of rice and proportion of rice to liquid as before, but the rice was from a new bag. All I can figure is that this bag of rice was younger and didn’t need as much liquid. Still, plenty tasty! For dessert, we has two items. The first was a date nute bread (recipe) from Ina Garten of the Barefoot Contessa series of cookbooks. 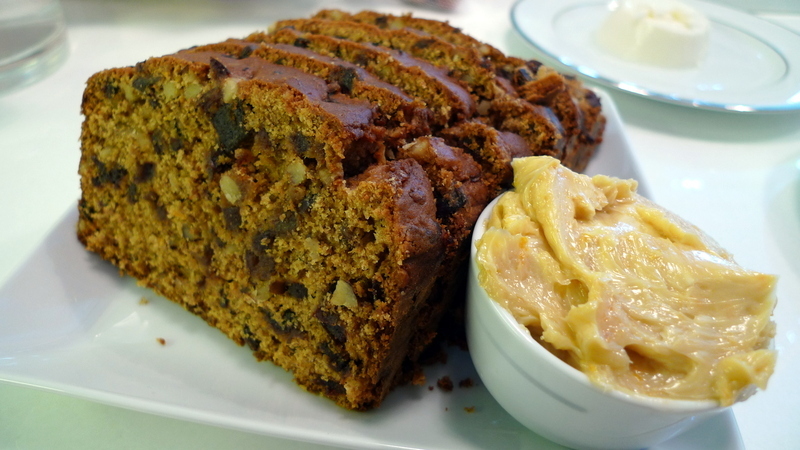 This is a quick bread similar to banana bread or zucchini bread. I think I overcooked it a little as it was dry. Tawn, however, likes his food drier than I do, so he thought it was perfect! Toasted, I think it would make no difference. On the side is a tub of butter whipped with a little honey and orange zest. 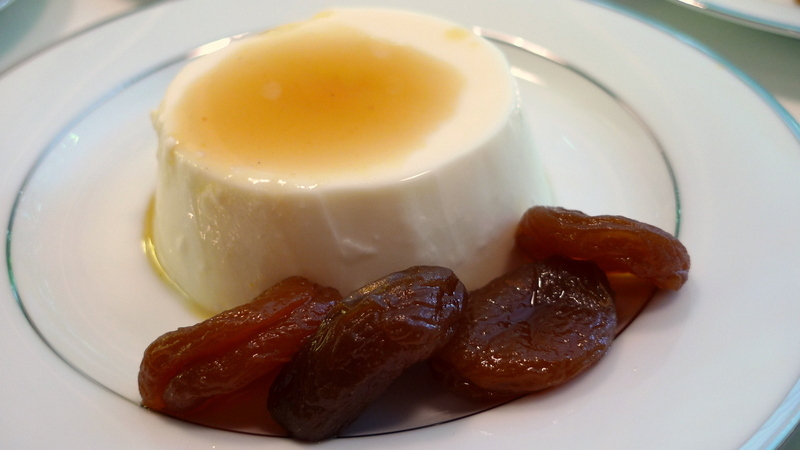 The final dish was a Greek Yoghurt Panna Cotta with dried apricots reconstituted in a white wine and honey sauce. (Recipe) This turned out very nice as the panna cotta is not overly sweet and has a nice tanginess from the yoghurt. Of course, by this point we were stuffed, and smaller servings would have been fine! All in all, the brunch was a success. Pleasant company and conversation, most importantly, and the food turned out nicely, too! This entry was posted in Uncategorized and tagged Apricot, Apricots, baking, Brunch, chicken, cooking, Date, Dates, food, Moroccan, Morocco, panna cotta, rice, Salad by christao408. Bookmark the permalink. Wow! The food sure looks like a fancy brunch at some fancy restaurant! I love the table settings, so elegant. 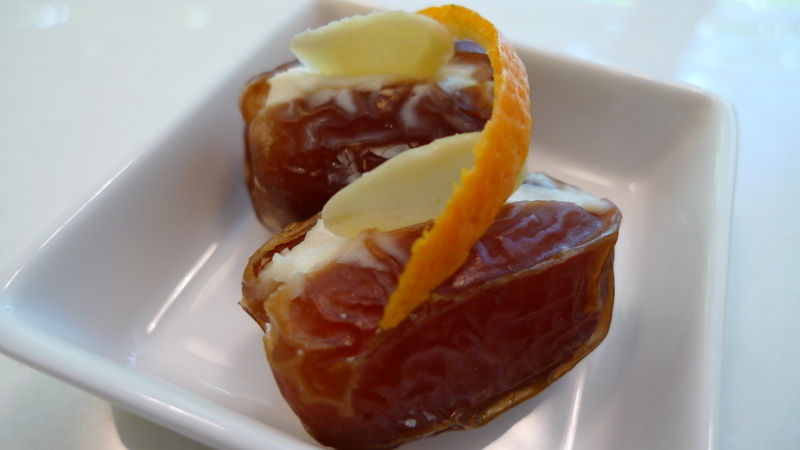 The dates stuffed with goat cheese look amazing although pretty much that includes goat cheese looks wonderful to me! the poor date is under-utilized as it’s so often associated with the grey hair set, which is unfortunate. Thanks for the lead to the drunken apricots and I’m stealing that appetizer idea. Such nice presentation, love the creativity with your date recipes. May I prebook a table at “Chris’ Bistro” on my nex trip to the Big Mango? A drool worthy brunch. I like the date, I’ll confess with out shame. Everything was perfection and I would have eaten the meal backwards since I’d be so sad to be too full for the Panna cotta! wow. You are a master! I am so glad that you tried the date/ tamarind sauce. I love it with any fritter/ samosa type of snacks too.The flat bread looks amazing, as does the salad. Have you tried the cumin/ lemon juice dressing Chris? It really is very refreshing. To a bowl of diced avacado, ripe tomatoes, cucumber and cilantro, add salt and pepper to taste and 1/2 tsp of cumin and 2 tsp or so of lemon juice. Toss well. The dressing should be added table side, and is very very good when used fresh. I think I’ve changed my mind about dates. I remember reading about some folks in Hong Kong who open up their apartments / homes for dinners for a fee. Maybe Iron Chef Chris can get paid for his hard work. (I know you cook for the love of cooking). WOW – do you hire out for special occasions. That all look beautiful!! All those dishes look great. Although I can’t say the last (desert) dish looks very appetising to me but I don’t really like jelloey substances. It’s nice you can get together and cook for your friends. My friends and I always seem to be eating out (but I’m not all that of a cook and neither are they). All your date themed topics made me crave for dates. So when I went to Mustafa last week, I looked for dates but they all didn’t look as tasty as yours. That looks like a great food. @NightlyDreams – Those jelly-like textures definitely are an acquired taste. I didn’t used to like them, either. For me, it is the creamy tartness of the panna cotta that I really enjoy. Very refreshing after a meal. @Fatcat723 – Very nice of you to say! The dishes turned out very photogenic this time. @ElusiveWords – You know, I’ve considered that idea, as well as that of being a chef. But the thing is, both those careers require consistency and I’m not very good at reproducing the same thing, the same way, time and time again. Kitchen ADHD – also known as lack of discipline in the kitchen! 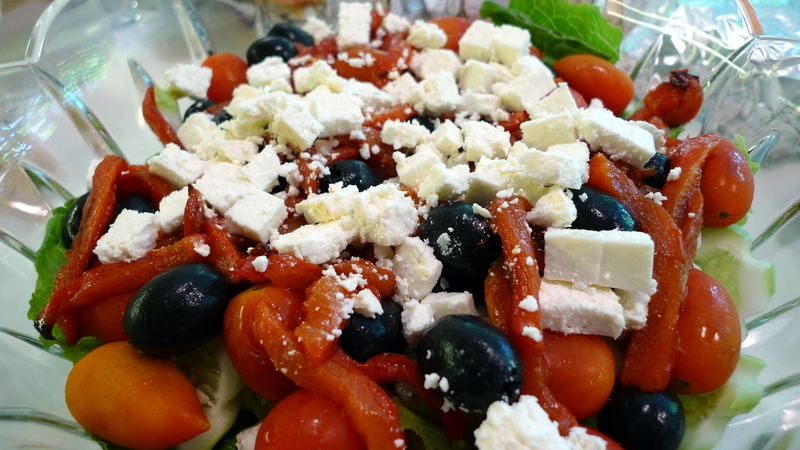 @ZSA_MD – Another wonderful recipe suggestion, Zakiah! Thank you. The market is having a special on Haas avocados from Australia so I’ll have to try this recipe this week. @murisopsis – One of the Thai guests also brought Thai desserts that we didn’t have room for in the end. I had suggested just before eating that maybe we should start with desserts. @CurryPuffy – There is always a place at the table for you, Gary. @AppsScraps – Steal away! I always associate prunes more with the grey hair set rather than dates, but regardless am happy to enjoy any tasty food item regardless of its normal audience. @TheCheshireGrins – To paraphrase Renee Zellweger in Jerry Maguire, “You had me at ‘goat cheese’.”@AzureRecollections – (Blushing…) Oh, thank you for the kind words. Not so much creativity, but just borrowing ideas and recipes from here and there. @Dezinerdreams – I’ll be sure to let Tawn know you approved of the table settings! @Senlin – If I can learn, you can, too! @beowulf222 – Actually, the dates I cooked with were the large 1kg bags of dates from Mustafa! The really nice ones I just save for snacking or for the amuse bouche. @vsan79 – Thank you – the company was the best part of the brunch, though! @christao408 – I see. Well, I was looking for ones for snacking and the Mustafa dates didn’t look too appealing. @beowulf222 – Yeah, I think most of their dates are dried rather than fresh. I hope you can find some! Everything, the food, the beautiful table setting look so inviting! I’m sure your guests enjoyed this hearty meal and felt so delightfully pampered! @icapillas – Thank you for your kind comment. Wow Now I am hungry for date nut bread. We Grill bacon wrapped dates stuffed with cheese. TO die for. I might try those you made. My husband is a date fan. @Ikwa – Oh, I wish I had a grill. That sounds like a perfect way to eat dates. Maybe I’ll just pan fry them… or use pancetta instead of regular bacon? @Wangium – Oh, I’m sorry Jason… =(@portiajules – I should recreate the meal and open it to all Xangans who want to attend! @yang1815 – It was pretty good, thanks, Andy. Lucky guests! My mouth is literally watering so must go get something to eat and wish your beautiful dishes were in my fridge. However a week from tonight I’ll be going to a special dinner prepared by a chef from Chicago who earned his “chefdom” or “chefness”(or whatever it’s called) in France. He’s coming back home for a weekend and helping at a fundraiser “From Ghetto to Gourmet” …. he’s preparing some of the food with help of course and will be the main speaker. I’ll post the menu and maybe take photos of the various courses too….inspired by you.